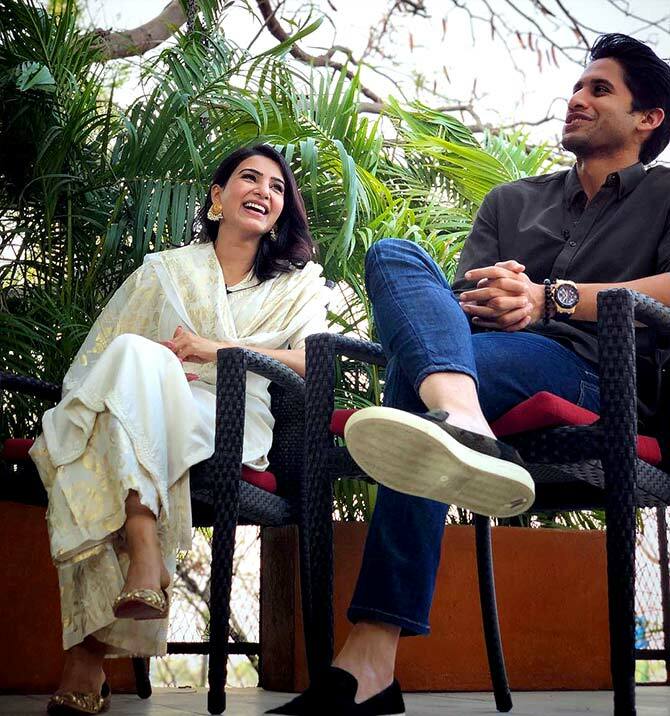 Nine years after he met Samantha Ruth Prabhu and fell in love with her on the sets of Gautam Menon's Ye Maaye Chesave, Naga Chaitanya is back with her in Majili, a film that -- in many ways -- reflects Naga's own journey as actor and husband. "When we met during Ye Maaye Chesave, we played young lovers discovering love," Naga tells Subhash K Jha. "Then we did a couple of other films together, including the family film Manam (starring Naga, his father Nagarjuna and legendary grandfather Akinenni Nageswara Rao) where our relationship both on screen and in our personal life evolved. Now in Majili, we play a married couple going through the process of adjusting with one another." Naga Chaitanya admits it wasn't easy being difficult with his wife on screen. "But then we had decided that whenever we work together, we would leave our personal relationship at home. Also, we were sure of one thing: Whatever we do together on screen has to take our combination ahead of our previous films together." This is where Majili came in. "I don't think I have played any character as dark and complex as the one in Majili," Naga confesses. "He was a challenge to play because that's not me. For me, there was always the dilemma between giving what the audience wants and doing roles that will take me further as an actor." "I think I've resolved that dilemma in Majili," he adds. "Earlier, I'd start off with the intention of doing what I felt was right. Then there would be some commercial tweaking. But not this time." "Majili is definitely my most honest work," he adds. "I want to aim for this level of honesty in all the films that I do in future." Majili is the story of a man's journey from first love to marriage. "There is a wide arc in the graph of my character. I start off as a young lover and then go on play a married man," he says. Naga's ever-young father Nagarjuna and uncle Venkatesh continue to inspire him. "What I learnt from them is to take risks in one's career, to go beyond the expectations of the audience and oneself. If my father had not taken risks, he wouldn't have done films like Shiva and Geethanjali. And Venky mama (Venkatesh) continues to do the unexpected. Look at how much fun he had doing F2. It is such a hit. We are so proud of him." So why wasn't Naga Chaitanya in F2 with his uncle? "Because we are doing another comedy, Venky Mama, where we play our real life roles of uncle and nephew. It's been a blast shooting with Venky Mama for Venky Mama," he says. Naga is all praise for the work done by his wife. "Samantha is constantly pushing the envelope. In fact, she is doing more work now and far more challenging roles than she did before she got married. Those old theories of audiences not wanting to see married actresses are done with."